Users arrange themselves in the lab's flexible workspaces. The lab offers two dozen meeting rooms. 125 Western Avenue welcomes its new users nearly around the clock. 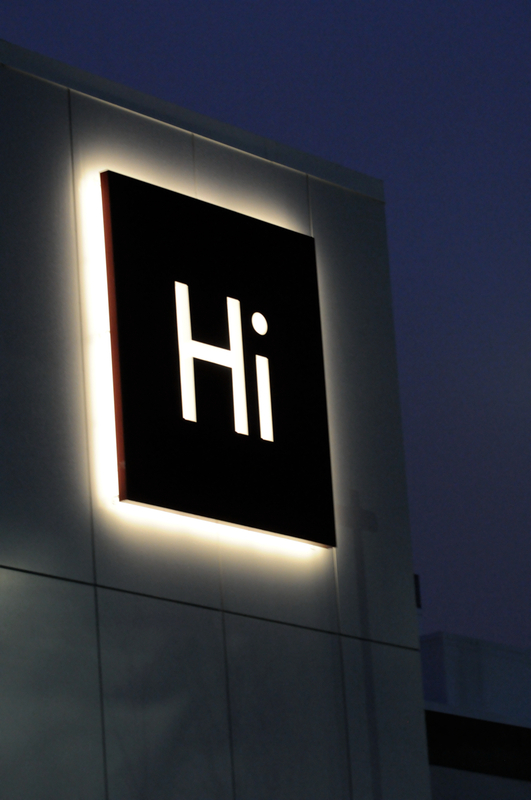 The Harvard Innovation Lab —“Hi” in its cheery logo (the modern sans-serif font centered in a crimson square)—was dedicated today, 13 months after the announcement of plans for the facility . 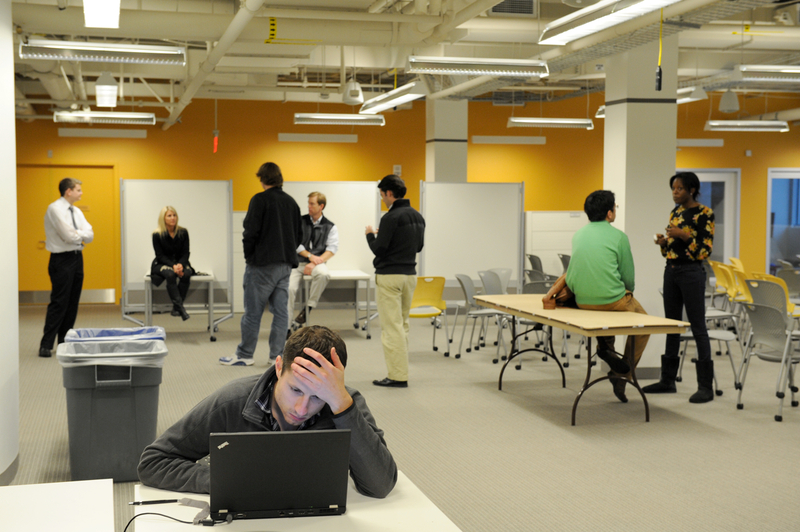 Adjacent to the Harvard Business School (HBS) campus in Allston, the lab occupies the renovated first floor of the former WGBH building at 125 Western Avenue; the two upper floors were renovated as team-based classrooms and project spaces  for HBS’s new first-year FIELD course  (which involves students in hands-on business challenges and visits to host companies around the world this January). Present for the formal opening celebration were Boston mayor Thomas Menino, president Drew Faust, and Nitin Nohria, dean of HBS, which paid for the renovation and lab staffing, while making the entire facility available to users throughout the University, and part of it to the surrounding Boston community. 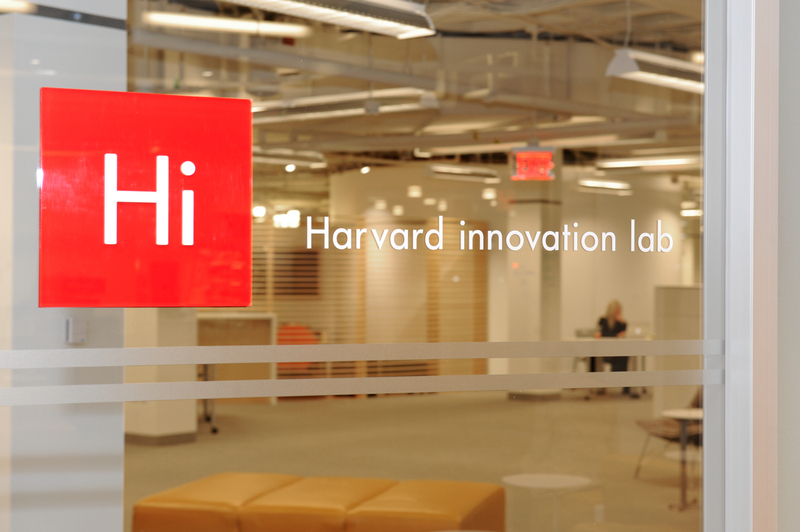 In remarks before the ribbon-cutting, Dean Nohria called the lab a "promise" in two senses: a commitment to bring people together from across Harvard, and from the broader Boston and indeed global communities; and an expectation that great things could happen as people discover one another and advance their ideas "in this great cauldron, the i-Lab." He saw the facility embodying "a wonderful spirit of 'Why not?' and 'How about?'" President Faust noted that in his inaugural address in 2010, Mayor Menino called for a "new era of shared innovation." For 375 years, she said, Harvard had been innovating (she rattled off examples starting with A, like anti-malarial compounds, but spared the audience the rest of the alphabet)—a continuous engagement with "using knowledge to invent the future." Today, she said, "inspiration and aspiration" drove faculty members and students to work on problems like improving maternal and infant health, simplifying financial-aid applications, and more. "Our history reminds us," she said, "that the gap between the possible and the impossible," between imagination and implementation, has been bridged regularly, and will be again and again in the future. In the new lab, Faust said, Harvard is "gathering great minds under a single roof, so they can become greater together." Mayor Menino, noting the community ties, said of the opening, "It's a great day for the neighborhood, isn't it?" Citing the city's own waterfront innovation district and large population of talented young people, he said, "Boston's a place where big ideas are born, because we have the talent to make those ideas a reality." What It Is: "Structured Spontaneity"
The lab itself is about 30,000 square feet of space, flexibly configured and furnished, where, according to Joseph B. Lassiter, “People can try out their ideas and see if they are worth putting to use.” Lassiter, who is M.B.A. Class of 1954 professor of management practice, serves as faculty chair of the lab . It is fitted out in the contemporary entrepreneurial manner: exposed ceilings, ventilation, and wiring; bare concrete floors; surfaces coated with white-board paint to accommodate free-form sketching and recording of ideas; a kitchen stocked with refrigerated sodas, candy, and an adjoining large-screen television with an Xbox Kinect game controller. There is a café for all-hours fueling, and a large lobby area with casual furniture where community users of the lab will be accommodated. 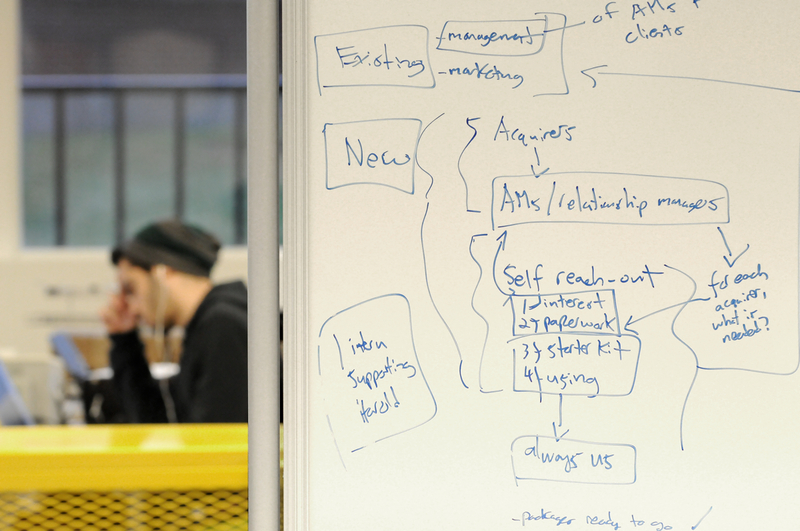 Within the lab are a couple of dozen meeting rooms, a classroom, and a workshop to build prototype devices. Furnishings in the common areas include wheel-mounted folding tables that can be rapidly rearranged, ceiling-mounted electrical connections on pulleys that can be similarly deployed, and so on—accoutrements selected to promote “structured spontaneity,” in the phrase of Gordon S. Jones, the lab’s professional director . Lassiter emphasized that the name—lab—was chosen deliberately. Hi is not a “center” or an “institute,” he said in a conversation at his HBS office (where results of his students’ businesses, from Nantucket Nectars juices to Finale, the dessert-restaurant chain, are on display). The point is not to create a new curriculum or program, he said, but to bring together and “accelerate” innovative and entrepreneurial energies from throughout the University. The lab, he said, “gives a place for a lot of the work to take place”—a necessity (given the inflexibility of dedicated teaching spaces, such as HBS’s theater-style classrooms) and an opportunity (given the work being done in schools throughout Harvard). In that sense, he emphasized the lab's role not as bringing about new behaviors per se, but more as a utility in bringing diverse activities together fruitfully and productively. His view of that work is expansive, extending from lectures, programs, and presentations that will reach thousands of members of the community, to more tailored practical experiences, to internships and residencies for experienced entrepreneurs, to incubation and mentoring of potential new enterprises. So far, he noted, 15 entrepreneurs and experts in residence (13 from among HBS’s alumni) have been chosen, from many volunteers, to be available at the lab, providing help in understanding venture finance, law, accounting, and subject-matter expertise. The lab’s workshops cover “tactical” subjects that complement course work—real-world knowledge, Lassiter said, that entrepreneurs need to test their ideas and pursue those that appear worthwhile. What distinguishes the lab’s approach from those of other institutions’ entrepreneurship centers (see below)? Lassiter cited three differences. First, he said, faculty members are involved from the outset—not just alumni and external practitioners. (The lab’s advisory board is made up of the provost, six deans—from HBS, the Kennedy School, the Law School, the School of Engineering and Applied Sciences [SEAS], the Faculty of Arts and Sciences, and Harvard College—and Xander University Professor Douglas Melton, co-director of the Harvard Stem Cell Institute .) As students engage in the lab, and faculty members teach there, he said, the lab will “impact the institution,” changing courses (like his own undergraduate offering on entrepreneurship and innovation; see below). Second, he said, is the nature of the lab itself. It is explicitly experimental; those who use it are, he said, “under no pressure to commercialize an idea” if it proves not appropriate for such development, or does not hold interest. He will judge the lab a success if it exposes much of the Harvard community to the idea of innovation in whatever realms students pursue, regardless of their commitment to entrepreneurial careers. Third is the lab’s mandate to extend into the community—Allston and Brighton, whose residents will be invited to use the facility to meet with small-business consultants, for example; and the world far beyond, wherever Harvard innovators are at work. Together, he said, these traits make the lab “a fitting addition for an institution like Harvard.” To meet student interest and to better serve the world, Lassiter said, “We have to change what we teach, who teaches it, and how we teach it.” One can read about the idea of bicycling, he said, but to master it, you have to get on the bike and practice. 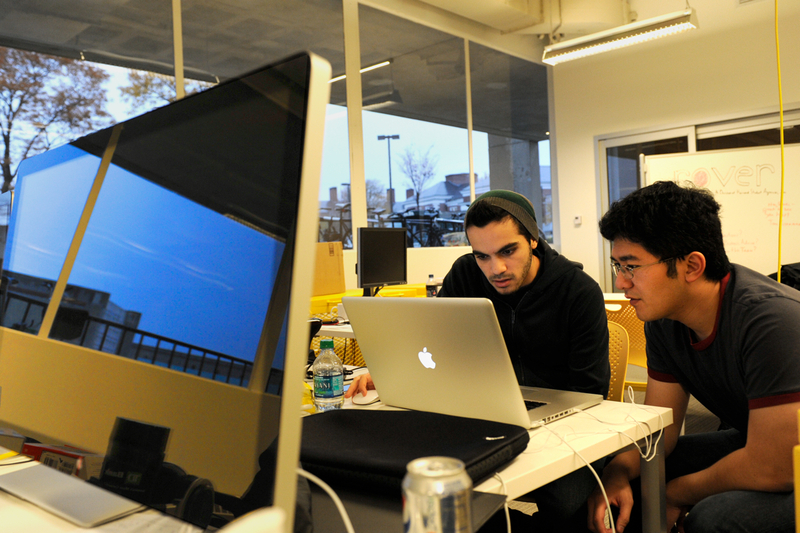 The lab, he hopes, will have a catalyzing role in accomplishing that, in part by “attracting the best students and faculty who regard innovation as central to their interests.” For those among them who do wish to pursue entrepreneurship per se, the lab “helps launch it faster, cheaper, with a higher chance of success” than would working alone. The person on whom this work principally depends is Gordon Jones, whose enthusiastic manner and boyish looks set an informal tone for the lab (as does the requisite blue button-down shirt, sans necktie, and the glass of Coke). 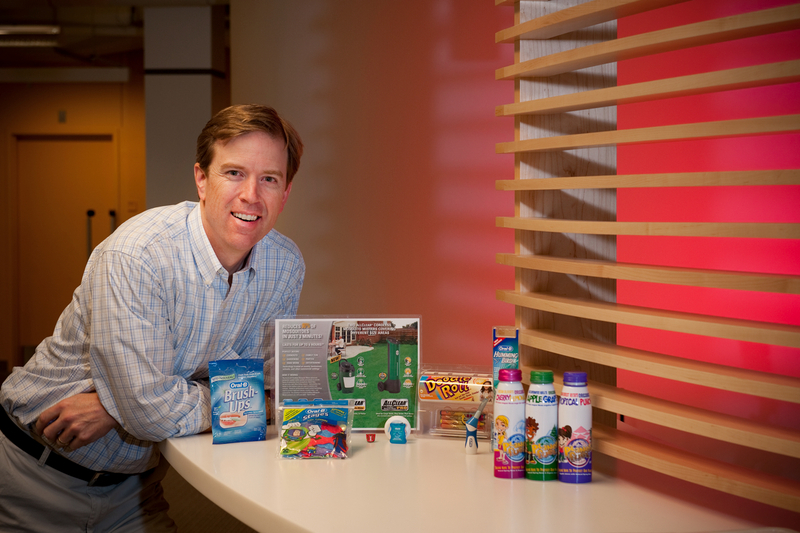 In fact, Jones brings to the task long experience as an entrepreneur and an "intrapreneur" who developed and nurtured both freestanding businesses and innovations within a corporate context, ranging from mosquito-control services (Mosquito Magnet) and a portable, disposable tooth-brushing product (Brush-ups) to organic juices and a dispenser outfitted with a roll of paper and crayons so children-on-the-go can indulge in drawing and doodling. During a high-speed tour of the lab, Jones rattled off its core programs and facilities: classrooms for teaching; experts in residence, for one to two days each a month, able to help with problems in design, law, finance, technology, and so on; and the flexible work spaces for whatever uses students, faculty members, and alumni imagine. Complementing these assets are flexible programs, such as entrepreneurship challenges; affinity groups formed around student interests (food-related entrepreneurship, for instance, or sustainable technologies); i-Lab-originated programming, like its January trip to Silicon Valley (see below); and so on. As the programs evolve and users engage, the lab will, in effect, assemble its own community where none now exists. Unlike other entrepreneurship centers, in Boston or at other educational institutions, Jones said, the Harvard lab does not charge rent and does not expect to extract ownership interests from student ideas. It is uniquely broad, and anti-"silo"—not tied, say, to just the business school, or engineering—and therefore welcoming of business ideas in any realm (social innovation for education, health policy, or better governance, etc.). The entire impetus, he said, is "student-centered, faculty-enabled, and faculty-authorized." And the approach, echoing Lassiter's vision, is of the "i-Lab as a farmers' market" where users can browse, not a program to which one applies and in which one enrolls. The aim, he said, is to create as resource-rich an environment as possible, and to let users take advantage of whatever resources will help them. M.B.A. pursuits. HBS is often popularly perceived solely as a training ground for finance and corporate careers (Boston Business Journal  quoted Michael J. Roberts , executive director of the school's Rock Center for Entrepreneurship, thus: “There are people who we’d like to attract who, I’m sure, do believe we are oriented to big companies and Wall Street.”). But in fact, the first-year required curriculum includes a semester course on “The Entrepreneurial Manager,”  and the new FIELD course was designed with a significant emphasis on innovation . The second-year elective curriculum includes, under entrepreneurial management, three dozen courses  spanning a spectrum of subjects. (For a detailed look at students’ experience in one core entrepreneurship course, see this Harvard Magazine feature.) Between class enrollments and the scores of entries in the annual business-plan contest, it is evident that entrepreneurship appeals to a significant cohort of the M.B.A. student body. The rise of engineering. A second impetus comes from the rapid growth of the engineering and applied sciences, reflecting both the 2007 elevation of SEAS’s status to that of a freestanding school —making it more visible to students and more attractive to faculty recruits—and surging enrollments in exciting new fields like bioengineering. The Crimson reports that 220 sophomores declared concentrations within SEAS this fall , meaning that 12 percent of upperclassmen are now pursuing studies in those fields. The enormous popularity of Computer Science 50 , with its hands-on projects and “Hack Harvard” programming nights, has helped make that field, out of favor after the dot-com bust a decade ago, appealing again. New courses like “Medical Device Design”  have engaged SEAS students with Harvard Medical School (HMS) faculty members and hospital practitioners to work on practical problems and create workable solutions. Apart from the obvious applied focus of SEAS, other Harvard schools are also exploring innovation, per se—for example, HMS’s Center for Primary Care held its first innovations conference in October . The Zuckerberg factor. With the rise of Facebook and other successful enterprises, entrepreneurship has regained some of the appeal that it had during the late 1990s—a change perhaps intensified by the 2008 financial crisis and the subsequent drying up of lucrative jobs on Wall Street and in consulting. When Facebook founder Mark Zuckerberg visited campus earlier this month  on an East Coast recruiting trip, he met with President Faust and was greeted like a rock star by a crowd of camera-wielding students. And for the first time, an HBS-created course is aimed squarely at undergraduates: United States and the World 36, Innovation and Entrepreneurship: American Experience in Comparative Perspective,  held on the HBS campus and co-led by Mihir A. Desai, Mizuho Financial Group professor of finance , and his colleague, Joseph Lassiter. Two hundred students applied for the 95 slots this fall; those who were enrolled experience HBS case-style teaching, guest lectures by faculty members from other schools involved in innovation in education and other areas, and a field-based innovation project of their own. The Competition. Finally, as entrepreneurship and innovation attract more interest, Harvard is, frankly, responding to competitive pressure from peer institutions. MIT has a long, deserved reputation for fostering engineering-based business start-ups; its Entrepreneurship Center  (directed by Bill Aulet ’80) offers a wide array of events and support programs for students and alumni, and is tied into a rich curriculum of dozens of management and venture-oriented engineering courses. Among research universities, Stanford is perceived as having especially entrepreneurial DNA: its president, John Hennessy, was a spectacularly successful entrepreneur, and is a director of the Stanford-born Google ; it has risen along with Silicon Valley; and it is widely known for academic programs that foster innovation, such as its Hasso Plattner Institute of Design (the “d.school,”  described in this recent Stanford Magazine cover story ). In two recent, dramatic steps, Stanford has become a frontrunner among institutions competing to establish a high-profile new engineering and innovation campus in New York City ; and its Graduate School of Business received a $150-million gift to establish a Stanford Institute for Innovation in Developing Countries , meant to help alleviate poverty in low-income areas through pertinent research, education, and promotion of innovation. As Stanford prowess extends eastward, and around the world, Harvard’s development office has made innovation a major theme in conversations with alumni supporters, and in emerging plans for the University’s next capital campaign. Students and faculty members are taking note, too: among the offerings of the Harvard lab is a January trip to Silicon Valley to visit, among other facilities, the Stanford offerings —among them, IDEO , a famous innovation consulting firm whose founder and chair, David Kelley , runs the d.school. IDEO partner Diego Rodriguez, M.B.A. ’01,  a d.school founding professor, is one of the HBS/innovation lab entrepreneurs in residence. These connections aside, Harvard clearly wants to compete for some of the allure attaching to these and other leading academic centers of innovation and entrepreneurship. Imagination needs a soil in history, tradition, or human institutions, else its random growths are not significant enough and, like trivial melodies, go immediately out of fashion. The soil of Harvard and of Boston, she said—a university and a city with rich histories in all fields—had long provided, and would continue to provide, suitable soil for the fruits of the imagination nurtured in the i-Lab to flourish.